Since the 16th century, Catholic piety has assigned entire months to special devotions. Toward the end of the eighteenth century a zealous Jesuit priest, Father Lalomia, started among the students of the Roman college of his Society the practice of dedicating May to Our Lady. The devotion, which others had promoted in a small way, soon spread to other Jesuit Colleges and to the entire Latin church and since that time it has been a regular feature of Catholic life. Thou who wast a virgin before thy delivery, pray for us. Hail Mary, etc. Thou who wast a virgin in thy delivery, pray for us. Hail Mary, etc. Thou who wast a virgin after thy delivery, pray for us. Hail Mary, etc. My Mother, deliver me from mortal sin. Remember, O Virgin Mother of God, when thou shalt stand before the face of the Lord, that thou speak favorable things in our behalf and that He may turn away His indignation from us. Thou art my Mother, O Virgin Mary: keep me safe lest I ever offend thy dear Son, and obtain for me the grace to please Him always and in all things. 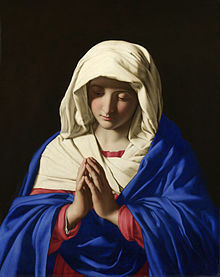 May we be assisted, we beseech Thee, 0 Lord, by the worshipful intercession of Thy glorious Mother, the ever-Virgin Mary; that we, who have been enriched by her perpetual blessings, may be delivered from all dangers, and through her loving kindness made to be of one heart and mind: who livest and reignest world without end. Amen. Hail, holy Queen, Mother of mercy, hail, our life, our sweetness, and our hope! To thee do we cry, poor banished children of Eve! To thee do we send up our sighs, mourning and weeping in this vale of tears! Turn then, most gracious advocate, thine eyes of mercy towards us; and after this, our exile, show unto us the blessed fruit of thy womb, Jesus! O clement, O loving, O sweet Virgin Mary! O blessed Virgin Mary, who can worthily repay thee thy just dues of praise and thanksgiving, thou who by the wondrous assent of thy will didst rescue a fallen world? What songs of praise can our weak human nature recite in thy honor, since it is by thy intervention alone that it has found the way to restoration? Accept, then, such poor thanks as we have here to offer, though they be unequal to thy merits; and, receiving our vows, obtain by thy prayers the remission of our offenses. Carry thou our prayers within the sanctuary of the heavenly audience, and bring forth from it the antidote of our reconciliation. May the sins we bring before Almighty God through thee, become pardonable through thee; may what we ask for with sure confidence, through thee be granted. Take our offering, grant us our requests, obtain pardon for what we fear, for thou art the sole hope of sinners. Through thee we hope for the remission of our sins, and in thee, 0 blessed Lady, is our hope of reward. Holy Mary, succour the miserable, help the fainthearted, comfort the sorrowful, pray for thy people, plead for the clergy, intercede for all women consecrated to God; may all who keep thy holy commemoration feel now thy help and protection. and for the love I bear thee, I promise to serve thee willingly for ever and to do what I can to make thee loved by others also. I place in thee all my hopes for salvation; accept me as thy servant and shelter me under thy mantle, thou who art the Mother of mercy. And since thou art so powerful with God, deliver me from all temptations, or at least obtain for me the strength to overcome them until death. From thee I implore a true love for Jesus Christ. Through thee I hope to die a holy death. My dear Mother, by the love thou bearest to Almighty God, I pray thee to assist me always, but most of all at the last moment of my life. Forsake me not then, until thou shalt see me safe in heaven, there to bless thee and sing of thy mercies through all eternity. Such is my hope. Amen. holy is his name; His mercy is from age to age on those who fear him. He has shown might with his arm; he has confused the proud in their inmost thoughts. Hail, most gracious Mother of mercy, hail, Mary, for whom we fondly yearn, through whom we obtain forgiveness! Who would not love thee? Thou art our light in uncertainty, our comfort in sorrow, our solace in the time of trial, our refuge from every peril and temptation. Thou art our sure hope of salvation, second only to thy only-begotten Son; blessed are they who love thee, our Lady! Incline, I beseech thee, thy ears of pity to the entreaties of this thy servant, a miserable sinner; dissipate the darkness of my sins by the bright beams of thy holiness, in order that I may be acceptable in thy sight. accept the solemn offering I present thee of this month, specially dedicated to thee, and receive my ardent, humble desire, that by my love and fervor I could worthily honor thee, who, next to God, art deserving of all honor. Receive me, 0 Mother of Mercy, among thy best beloved children; extend to me thy maternal tenderness and solicitude; obtain for me a place in the Heart of Jesus, and a special share in the gifts of His grace. 0 deign, I beseech thee, to recognize my claims on thy protection, to watch over my spiritual and temporal interests, as well as those of all who are dear to me; to infuse into my soul the spirit of Christ, and to teach me thyself to become meek, humble, charitable, patient, and submissive to the will of God. May my heart bum with the love of thy Divine Son, and of thee, His blessed Mother, not for a month alone, but for time and eternity; may I thirst for the promotion of His honor and thine, and contribute, as far as I can, to its extension. Receive me, 0 Mary, the refuge of sinners! Grant me a Mother’s blessing and a Mother’s care, now, and at the hour of my death. Amen. O thou most holy Virgin Mary, who dost evermore stand before the most holy Trinity, and to whom it is granted at all times to pray for us to thy most beloved Son; pray for me in all my necessities; help me, combat for me, and obtain for me the pardon of all my sins. Help me especially at my last hour; and when I can no longer give any sign of the use of reason, then do thou encourage me, make the sign of the cross for me, and fight for me against the enemy. Make in my name a profession of faith; favor me with a testimony of my salvation, and never let me despair of the mercy of God. Help me to overthrow the wicked enemy. When I can no longer say: “Jesus, Mary, and Joseph, I place my soul in your hands,” do thou say it for me; when I can no longer hear human words of consolation, do thou comfort me. Leave me not before I have been judged; and if I have to expiate my sins in purgatory, oh! pray for me earnestly; and admonish my friends to procure for me a speedy enjoyment of the blessed sight of God. O blessed Virgin, Mother of God, look down in mercy from heaven, where thou art enthroned as Queen, upon me, a miserable sinner, thine unworthy servant. Although I know full well my own unworthiness, yet in order to atone for the offenses that are done to thee by impious and blasphemous tongues, from the depths of my heart I praise and extol thee as the purest, the fairest, the holiest creature of all God’s handiwork. I bless thy holy name, I praise thine exalted privilege of being truly Mother of God, ever virgin, conceived without stain of sin, co-redemptrix of the human race. I bless the Eternal Father who chose thee in an especial way for His daughter; I bless the Word Incarnate who took upon Himself our nature in thy bosom and so made thee His Mother; I bless the Holy Spirit who took thee as His bride. All honor, praise and thanksgiving to the ever-blessed Trinity, who predestined thee and loved thee so exceedingly from all eternity as to exalt thee above all creatures to the most sublime heights. 0 Virgin, holy and merciful, obtain for all who offend thee the grace of repentance, and graciously accept this poor act of homage from me thy servant, obtaining likewise for me from thy divine Son the pardon and remission of all my sins. Amen. Remember O Most Gracious Virgin Mary! Inspired by this confidence, I fly unto Thee! Why Don’t You honor Mary? A Comparison is Instituted Between the Disobedient and Sinning Eve and the Virgin Mary..
How could Mary be the Mother of God? 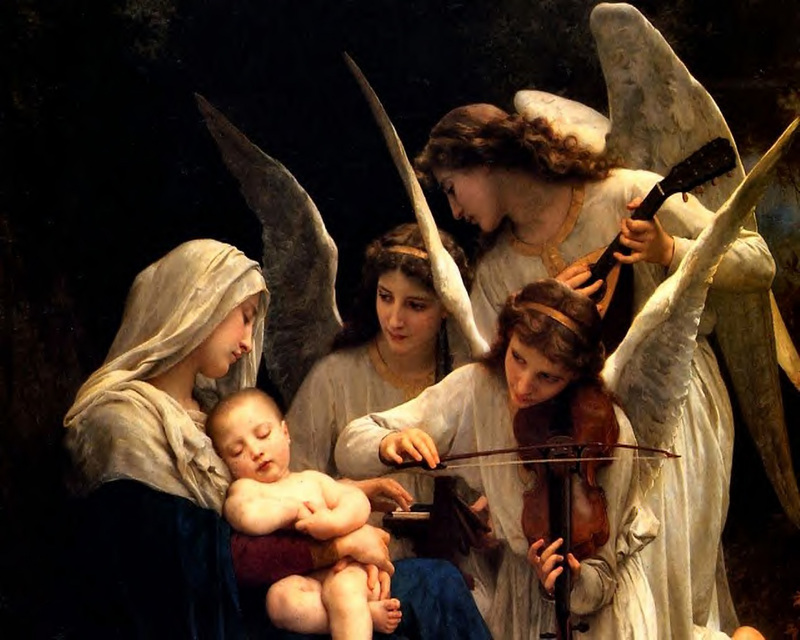 When Did Belief in the Virgin Birth Begin? Evangelization: The Mission of the Laity, That the lay faithful may fulfill their specific mission, by responding with creativity to the challenges that face the world today.